US actress Lori Loughlin, of the sitcom Full House, has surrendered to authorities in Los Angeles after being charged in a college cheating scam. Her husband, designer Mossimo Giannulli, was in court on Tuesday, along with Desperate Housewives star Felicity Huffman, who was also charged. They are among the 50 people implicated in a criminal scam to get their children into top US colleges. Yale, Stanford and Georgetown were among the destination universities. The accused parents – many of whom are celebrities or CEOs of major companies – are said to have paid a firm up to $6.5m (£4.9m) to cheat on students’ college entrance exams and bribe top coaches to offer fake athletic scholarships for non-athletic students. The schools have not been accused of wrongdoing and several are investigating the matter internally as well. Ms Loughlin and her husband have been accused of paying $500,000 in bribes to have their two daughters admitted into the University of Southern California (USC) as fake rowing team recruits. She has been charged with conspiracy to commit mail fraud and honest services mail fraud. Mr Giannulli faced the same charges on Tuesday and was forced to put the family’s house up as collateral to pay his $1m bond. According to an FBI statement, she was arrested on Wednesday morning in Los Angeles after returning from Vancouver where she reportedly had been filming, and will appear in a federal court at 14:00 local time (21:00GMT). 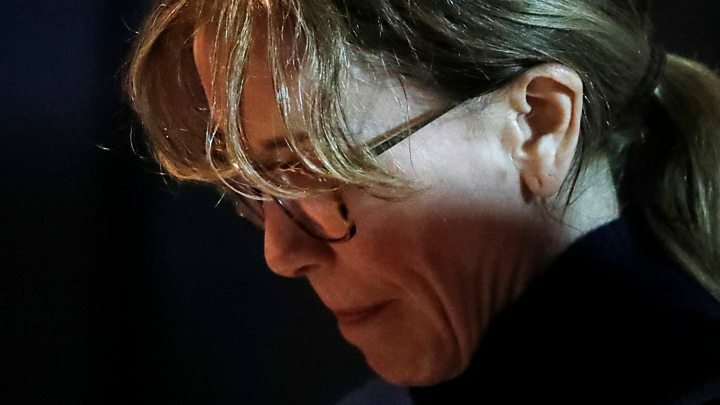 Fellow celebrity Ms Huffman – who allegedly paid $15,000 to participate in the exam cheating scam – was taken into FBI custody on Tuesday as well, and made to surrender her passport in court. The Academy Award nominee was charged with conspiracy to commit mail fraud and honest services mail fraud. She was released on $250,000 bail. Her husband, actor William H Macy, accompanied her to court, but he has not been indicted in the scam. Parents paid anywhere from thousands of dollars to millions to Edge for its services, authorities said, earning Singer about $25m between roughly 2011 and 2018. For comparison, the average cost of yearly tuition in the US for a four-year college course is between $23,000 and $47,000 depending on whether it is a public or private institution. For the exam cheating scam, the firm reportedly had parents claim their child had a disability meriting extra time to complete the test. Then they were told to invent an excuse to ensure their child sat the exam at a specific facility where staff had been bribed to turn a blind eye to cheating. 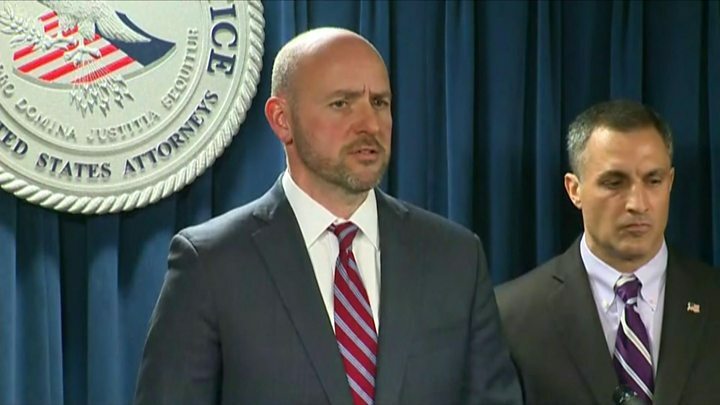 Edge staff members who assisted in the cheating were briefed on exactly how well to perform so as to avoid suspicion that a child’s scores had improved too much, the FBI said. Officials were able to secretly record Ms Huffman discussing this scheme with a co-operating witness. A co-operating witness told authorities they met Ms Huffman and Mr Macy at their Los Angeles home and explained the plan in detail, and the pair agreed. It is not yet clear why Mr Macy has not been charged as he was allegedly recorded discussing the plot – but Ms Huffman was the one who reportedly sent the emails organising the exam scheme for her eldest daughter. She apparently had arranged to do so for her younger child as well before changing her mind. William H Macy, Felicity Huffman and the couple’s two daughters at a 2014 movie premiere. Edge’s second scam option involved bribing coaches at top institutions to recommend the fraudulent applicants internally on athletic scholarships, according to the FBI. In addition, Edge is accused of fabricating athletics profiles for non-athletic students, sometimes even photo-shopping the faces of these students onto photographs of other athletes. Ms Loughlin and Mr Giannulli’s daughters, Olivia Jade and Isabella, are both currently studying at USC and were admitted as rowing team recruits – but neither actually participates in the sport. (From left to right): Olivia Jade Gianulli, Lori Loughlin and Isabella Gianulli. Ms Loughlin reportedly used the scam to get her daughters into USC. Mr Singer pleaded guilty on Tuesday in Boston federal court to charges including racketeering, money laundering, and obstruction of justice. At his sentencing in June, Mr Singer could receive a maximum of 65 years in prison and have to pay more than $1m in fines. In all, 33 parents were charged on Tuesday as well as 13 athletics coaches and associates of Mr Singer’s business. In most cases, the students did not know their admissions had been paid for with bribes, but in several the students were involved, officials added. One student apparently gloated about the exam cheating scam. Her parents are accused of paying hundreds of thousands to arrange her admittance into Georgetown by bribing the tennis coach and cheating on tests. The universities involved – including Georgetown, Yale, UCLA, Wake Forest and the University of Texas – were quick to release statements regarding the investigation, dubbed Operation Varsity Blues by authorities. USC said it had fired two employees indicted in the alleged bribery scheme: senior associate athletic director Donna Heinel and water polo coach Jovan Vavic, who is accused of placing two students on his team in exchange for $250,000. On Twitter, many expressed their outrage through memes poking fun at the celebrities and threads detailing how the US school system is already biased in favour of wealthier, white Americans. Ms Loughlin’s daughter Olivia Jade, who is a social influencer with over a million followers on Instagram, has been trolled on her public accounts over the scam. And the scandal has also rekindled scrutiny over how Jared Kushner, President Donald Trump’s son-in-law, got into Harvard. Mr Kushner’s father reportedly pledged $2.5m to the school just before he was accepted. In China, 2,440 pharmacists were accused of cheating by using earpieces in a national licensing test in 2014, according to China’s state TV. Exam cheating is widespread in India. In 2015, several hundred people were arrested in connection with mass school exam cheating in the state of Bihar. A year later student Ruby Rai, who’d been ranked first in state exams, was arrested and her results cancelled after video of a college interview she’d flunked went viral. Last year, a Singaporean tutor admitted helping six Chinese students cheat in what prosecutors said was an elaborate plot. More students are cheating in GCSE and A-level exams in England, new figures showed last year. The number caught was up a quarter on the previous year. Most were penalised for taking mobile phones into the exam.